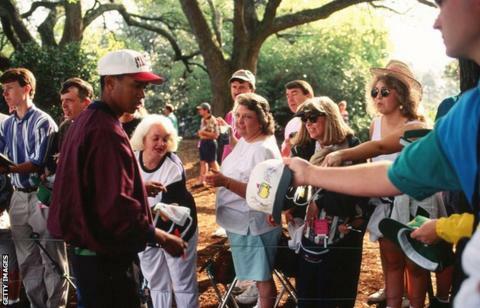 Tiger Woods was underwhelmed by his first glimpse of Augusta National. He spent the daytime practising relentlessly. With his parents staying in town, and Woods out on the course at every opportunity, Earl joked with reporters at a news conference during the build-up that it was the first opportunity he'd had to say "Hi, Tiger". "Hi, Pop," his son responded, before suggesting the first major of his career was "just another tournament" and insisting the main focus was to get his game ready for Thursday's opening round. Woods was mixing with the stars for the first time at a major, heading out for practice rounds with Nick Faldo, Raymond Floyd, Greg Norman and Fred Couples after arriving on the Sunday. In his round on Monday with Faldo, Woods caught the then two-time Masters champion's eye as he reached the par-five 15th hole in two strokes. "He hits it long," said Faldo, explaining the teenager's shoulders were "impressively quick through the ball - that's where he's getting his power from". That power was something Woods' first coach Rudy Duran witnessed when he was just four years old. Woods' father Earl, a Vietnam veteran, would take his young son to hit balls on the military courses near their home in Orange County, south California - and by the time his mother, Kutilda, took the child prodigy to Heartwell Golf Course in Long Beach, Tiger was swinging like a natural. On his first meeting with Woods, Duran walked him to the range and teed up four balls before stepping back and watching his new pupil unleash a kindergarten-sized club. "Bam, bam, bam, bam… he hit four perfect drivers about 60 yards. I was like 'Woah!'" Duran tells BBC Sport. "Then I threw some balls down on the chipping green. He chipped them on and turned around and asked me - he had a little stutter - if I wanted him to 'pop them up'. "I remember hearing Tiger say he wanted to win the US Open when he was about seven. He had dreams of winning major tournaments when he was quite young, but I wasn't grooming a pro - he could trip and fall and break his arm or crash his bike or something, it wasn't the mission for his parents or me to make him a pro." Woods' parents were deeply proud and emotionally invested in their son's burgeoning golf career, but while growing up his mother had instilled an academic focus - homework came before practice. That was an attitude Woods would take with him to Stanford University in 1994, having penned a handwritten note to men's golf coach Wally Goodwin four years earlier expressing his interest in joining a team that previously boasted players such as Tom Watson - a letter the coach still treasures. "He could have gone anywhere in the country - everybody knew about him, everybody wanted him," says Soltau, who watched wide-eyed as Woods hit balls on the cold autumn afternoon they met during the player's first semester. "What sold Tiger on Stanford was the academics, especially his mum. She was determined he get a great education. "If you ask him now, he'll say his two years at Stanford were two of the best years of his life. It was an adjustment for sure, because for him being as famous and successful at a young age as he was, he wasn't sure how he would fit in. What he quickly discovered was it was a pretty high curve. "Everybody at Stanford excels in something - whether it's business or arts or music, you name it, everybody has something special and he liked that. For the first time in his life he could be kind of anonymous, walk around and nobody would bother him. He could do what he wanted to do." When not playing golf or studying, Woods would enjoy chatting with other students in his dorm - something they called "rapping". "He loved to rap, sometimes all night with people from all different backgrounds," adds Soltau, now an assistant director of communications for Stanford Athletics. "He was like a sponge - he soaked things in and listened a lot. "He remarked about how some guy down the hall built a computer from scratch in his freshman year and another guy was getting ready to start his own company - those are Stanford-like things that he loved and embraced." Six months into his tenure at Stanford, and after winning his first college tournament to settle a bet with coach Goodwin that meant he did not have to obey the tradition of first years loading the team's luggage on away trips, Woods found himself on the opening tee at Augusta ready to play his first hole in a major, his parents ready to walk every hole with him. Woods was always going to generate interest on his Masters debut - he had been under the media spotlight since the age of two when he took on comedian Bob Hope in a putting contest on The Mike Douglas Show, although the youngster just saw those TV appearances as eating into time when he could be playing golf. He was only the fourth black player, and first black amateur, to compete at Augusta. He was the reigning US amateur champion and a prodigious talent who had won every major junior championship. Having been paired with defending champion Jose Maria Olazabal in the first round Woods recovered from an opening bogey, in which he rolled a long-range putt beyond the hole and off the other side of the sloping green, to birdie the par-five second after a magnificent approach to the green from beneath some trees. Attempting to get to grips with the buzz of a packed Augusta, the fresh-faced amateur dropped further shots at three and five but clawed his way back to level par by the time he reached Amen Corner, only to card another bogey in view of the colourful azalea flowers at 13. Making short work of the par-five 15th, Woods again recovered and headed back to the clubhouse having signed for a level-par 72 that impressed Olazabal. "I needed binoculars to see where he hit the ball," said the Spaniard. Woods continued his form in Friday's play, spending most of the round at one under par - making birdie at the 13th after navigating a pine tree and clearing Rae's Creek - before a bogey at the 18th ensured he carded a second successive 72 and became the only amateur to make the cut for the weekend. That evening Earl drove his son out to Forest Hills, a nearby public course, to host a free golfing clinic as a way to honour the local black men who were used as caddies in the Masters until 1982. "It's a way of saying thank you and a promise to carry the baton," said Earl at the time. Woods steamed into Saturday's play with early birdies to take him within five shots of eventual winner Ben Crenshaw, but Augusta bit back and a humbling four-putt from the edge of the green on the par-five eighth marked the beginning of a difficult spell that saw him finish on five over for the day and drift out of contention. The teenager could not hide his frustration, believing he should have been in the running to claim the Green Jacket. "I feel like this place is perfect for me. I guess I need to get to know it better," he added, before heading to the range and wowing onlookers by hammering a drive over the netting in the distance. With the pressure off, Woods signed off with three birdies in his final four holes to piece together another fine 72 on Sunday and finish tied 41st. It laid the foundations for him to win the Green Jacket two years later after turning professional. "It gave him a better understanding of what the environment and atmosphere was like," says Soltau. "To soak it all in and know this was a place he belonged and could play and win on. "That set him up for success in 1997, because by then he was a little bigger and stronger and more mature, and more accomplished." Woods left Augusta National that evening after his Masters debut came to a close to rush back for a history class at Stanford on Monday morning, but not before signing off with a letter of thanks to the club's membership. Since that underwhelming first impression seven days earlier, the 19-year-old had fallen in love with a venue he would go on to dominate - adding to his first Masters title in 1997 with wins in 2001, 2002 and 2005, as well as a further nine top-10 finishes to date. "Please accept my sincere thanks for providing me the opportunity to experience the most wonderful week of my life," wrote Woods. "It was Fantasyland and Disney World wrapped into one. I was treated like a gentleman throughout my stay and I trust I responded in kind. The Crow's Nest will always remain in my heart and your magnificent golf course will provide a continuing challenge throughout my amateur and professional career. "I've accomplished much here and learned even more. Your tournament will always hold a special spot in my heart as the place where I made my first PGA cut and at a major yet! It is here that I left my youth behind and became a man. For that I will be eternally in your debt."